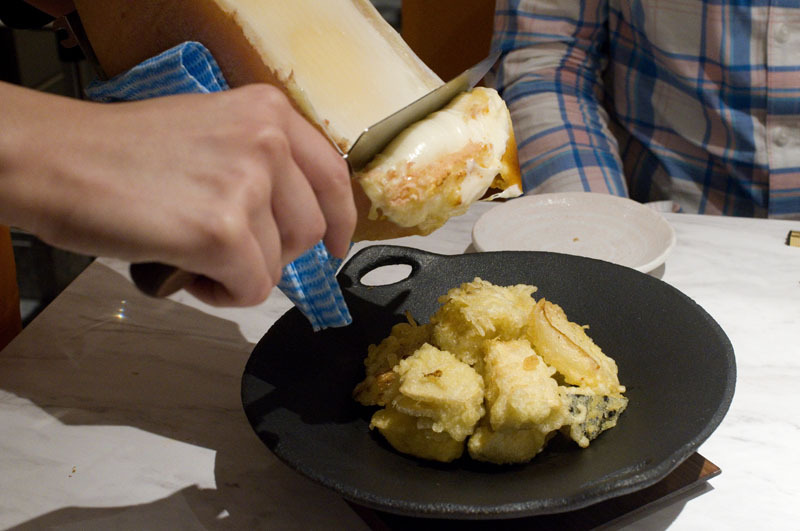 While fondue and raclette specialty restaurants are popping up all over Tokyo, Tensai takes a unique approach, supplementing those cheesy staples with unusual Japanese-influenced fare such as cheese tempura and cheese-based tofu dishes. 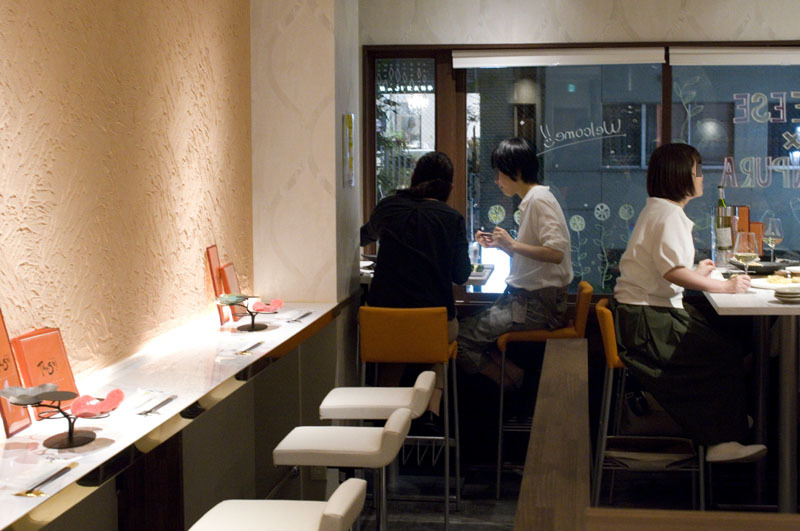 The setting is comfortably casual, with mostly counter seating and a handful of small tables. At the heart of the menu is a big selection of both cheese and non-cheese tempura items, all of them featuring top-grade vegetables and seafood. 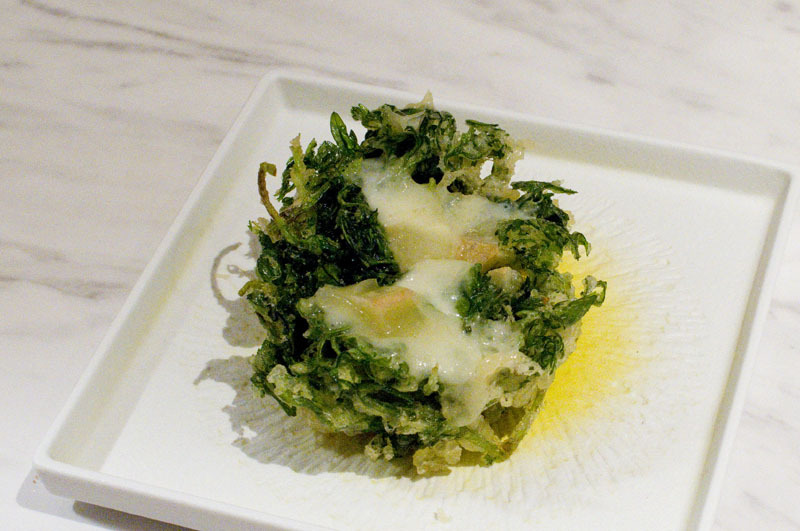 During a recent meal we enjoyed some inspired combinations of flavors - lotus root paired with shiso leaf and gouda cheese, shiitake mushrooms with pesto, and a sublime coriander kakiage-style tempura with cheese. The beautiful vegetables are sourced from a small farm in Shimane Prefecture, and some other highlights included fresh bamboo shoots, plump onions, Incan potatoes, and tender baby corn. 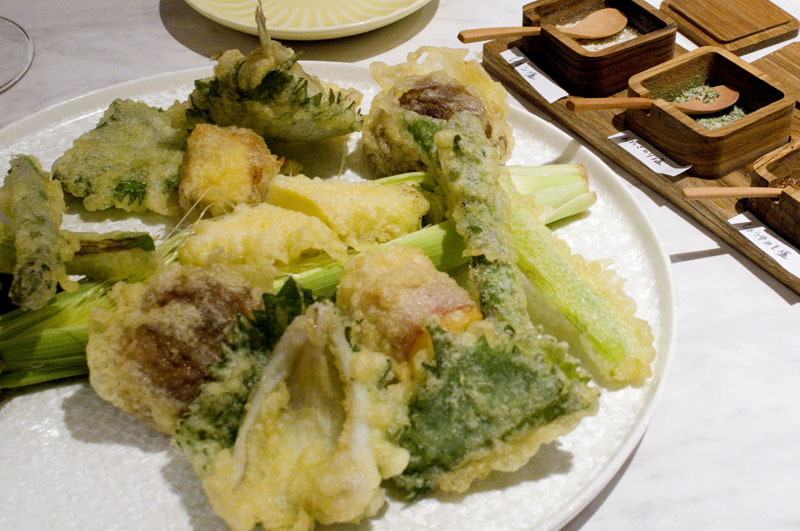 Regular seafood tempura items like kisu (whiting) live up to the same high standards as the cheesy inventions. The tempura here is a bit oily rather than bone-dry, but the natural oiliness balances well with the ingredients, enhancing rather than overpowering their fresh flavors. Three different artisanal salts - infused with lemon, aonori and soy-miso - are provided in place of dipping sauce. 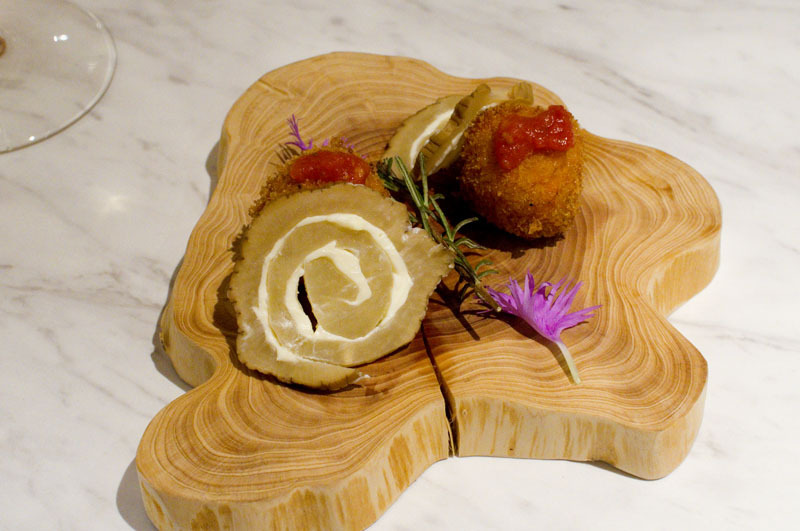 The kitchen also turns out various creative small plates to balance out all the fried food, with dishes like smoked-cheese potato salad, and a crunchy iburigakko smoked-pickle amuse-gueule. The chef also deserves a word of praise for his consistently attractive plating - every dish arrived looking ready for its own photo session. In addition to the mostly French wine list there's a small selection of sake and shochu. Budget around Y3500-5000 for dinner with drinks. Shibuya-ku, Ebisu 1-9-5, Ebisu Malt Bldg 2F.